The number of nations whose citizens are eligible for visas on arrival (VoA) in India is likely to be expanded to include 13 countries largely from Europe, south-east and central Asia after a review convened by the PMO felt security conditions need not be a hurdle to promote tourism. Countries that could be offered VoA include Malaysia, Thailand, Brunei, Spain, France, Germany, Sweden, Russia, Ukraine, Kazakhstan, Brazil and South Africa. At the meeting – also attended by officials from other ministries like culture and environment – it was made clear that security cannot be invoked to strike down important government initiatives. Home ministry has been asked to work on details of the proposed visa regime in a manner that factors in security concerns by utilizing information-sharing agreements with Asean and the European Union while ensuring that travel to India becomes less hassle-free. At present, 13 countries whose nationals can avail a visa on arrival include Finland, Japan, Luxembourg, New Zealand, Singapore, Cambodia, Indonesia, Vietnam, the Philippines, Laosand Myanmar. But the list excludes more populous nations even in the Asean who can be tapped for a much larger tourist footfall. On tourism, the Prime Minister’s Office (PMO) has also asked the ministry of external affairs to resolve the confusion around restrictions on re-entry of tourists within a 60-day period. 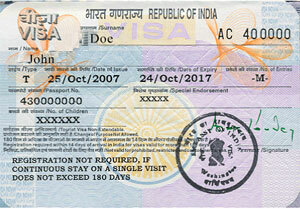 The visa rule is likely to be relaxed and a solution reached in the next one month. Besides increasing VoA facility to four additional airports, including Goa, Hyderabad, Kochi and Bengaluru, the PMO has asked the civil aviation ministry to improve the facilities in the existing airports of Mumbai, Kolkata and Chennai so that tourists do not have to stand for hours for emigration and other clearances. The ministries of home and civil aviation have also been asked to increase counters and accept immigration fees in both Indian currency and dollars.